On the 12th day of Homemade Christmas, I made a beautiful Chocolate Cake with Peppermint Mocha Frosting. It’s February! That means this month some of y’all may be celebrating Valentine’s day. For those of you that are eating healthier Valentine’s day doesn’t mean that all your healthy eating goals need to be set aside for the day. You can still have sweet treats and eat healthy. 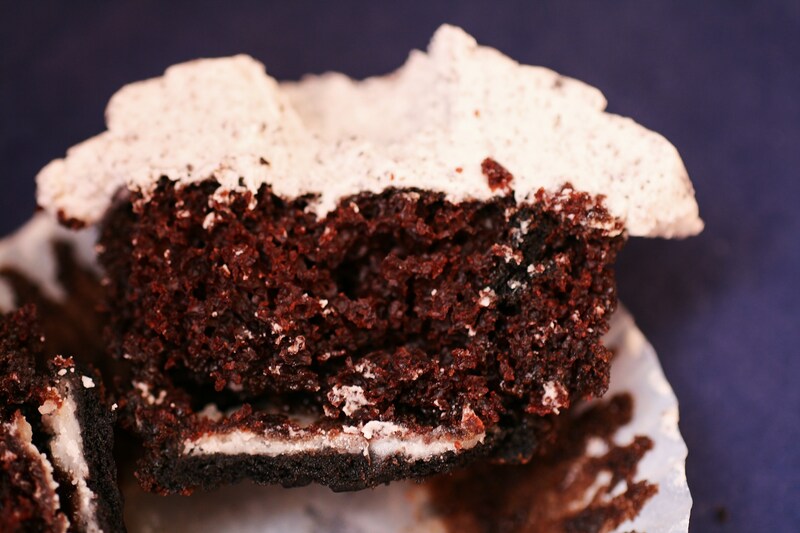 I recently discovered a great flourless chocolate cupcake recipe that is perfect for special occasions. The other day my daughter was begging me to make coffee cake. In her sweetest voice she said please and told me I could even take pictures and put it on my blog. How can I say no to her when she asks so nicely and gives me a blogging idea, so of course I made her a coffee cake. Not just any coffee cake, my mom’s coffee cake, what my siblings and I called, crater cake. Halloween is almost here and I have one more quick tip and recipe for you! One of my favorite types of frosting is Italian Meringue Frosting. It is light and super fluffy and reminds me of marshmallows. An added plus of this type of frosting is that you can also take a hand torch and toast it for an added twist. You can use it in so many different ways but one of my favorite ways is to pipe the meringue into ghosts on top of a cake or for cupcakes. Meringue may sound difficult but it is rather simple. The first step is getting out your eggs and separating them. Cold eggs are easier to separate so separate the yolks from whites and then allow the white’s to become room temperature. A room temperature egg whites whip up more easily for a beautiful meringue. While your whites are coming to a room temperature it is the perfect time to cook your sugar syrup. Combine your sugar, water, and cream of tarter together and cook on medium- high heat until the sugar is dissolved and the sugar mixture is bubbly and getting happy. Now is the time to start your meringue. Add your egg whites to the bowl of your mixer and whip the egg whites and vanilla to soft peaks. Finally slowly add the sugar mixture while whipping constantly until stiff peaks form. This should take about 7 to 10 minutes. Fill your piping bag with frosting, snip off the end (no tip is required!) and pipe little ghost like shapes. When you are done take black food coloring and fine paint brush and paint on faces and voila you have a an easy to make cake that looks like it took you hours to make! If you need a last minute Halloween dessert this is the one for you! Just remember this frosting for other sweet treats you make. This frosting is perfect for making things like smores and lemon meringue cupcakes. What treats are you making for Halloween? In a saucepan, stir together the sugar, water and cream of tartar. Cook over medium-high heat until the sugar is dissolved and the mixture is bubbly. In a medium mixing bowl, whip the egg whites and vanilla to soft peaks. Gradually add the sugar mixture while whipping constantly until stiff peaks form, about 7 to 10 minutes. Frost the cake of your choice. If there is one cake that my husband seriously cannot resist it is Carrot Cake with Cream Cheese Frosting. It is his all time favorite. If he could he would eat a whole cake all by himself. He is not a fan of sharing his carrot cake but I make him. The kids and I love carrot cake too. It is good stuff and we can pretend it is healthy since it has carrots in it. Screw that, it is healthy because it has carrots in it. I remember the first time I had carrot cake. I was over at a friends house for a play date. This is extra memorable because it wasn’t one of my neighborhood friends. Her mom gave us a snack and it was carrot cake. I had never had it before but I liked it. The next time I had carrot cake was as an adult and newly married to my husband. He told me it was his favorite cake and I decided he needed one. I soon discovered that carrot cake cake mix and store bought cakes were not going to work. I have odd food allergies, pineapple and coconut. Who knew they were ingredients to carrot cake, well some of them. I sure didn’t. I then went on a mission to find the best carrot cake recipe out there! After all homemade, from scratch cakes are the best! The recipe came out of a cook book I had bought thinking every family needed a Betty Crocker cook book. After all my mom had one as did my grandma along with the classic Better Homes and Gardens cook book. Anyways, back in 1999 we didn’t have a home computer with internet (that came in 2000) and forget about smart phones. Cook books and handed down recipes were the way to go when you needed a recipe. I grated my carrots by hand and put my recipe together, only tweaking a little bit here and there. Then I waited for my husband to come home and it was a success! I have now been making this carrot cake for 16 years and the only part I have played with over the years was finding the perfect cream cheese frosting to go with it. I have even successfully been able to make it gluten free. I have made this carrot cake for cake auctions, bake sales, team parties and just for friends and it has never disappointed. It really is that good! If you like carrot cake as much as my family does this recipe needs to be added to your to make list. It is tried and true and doesn’t disappoint. Make it for yourself and your family and friends and let me know if you like it as much as we do! Prepare 13x9 or 2, 9 inch round baking pans with cooking spray. Mix sugar, oil, applesauce and eggs until well blended. Stir in Gluten Free flour blend, baking soda, xanthan gum, cinnamon, nutmeg and vanilla and mix well. Stir in shredded carrots. Pour into prepared baking pans. Bake 13x9 in cake for 40-45 minutes, 9 inch rounds for 30-35 minutes or until a toothpick inserted in the middle comes out clean. Cool in pan on wire cooling rack. It is Thanksgiving week, have you finalized your meal plan? Not yet? Did you get a last minute invite and need something to bring? I’m here to help with a Gluten Free Upside-Down Double Apple Coffee Cake that is perfect for Thanksgiving. It is easy to make but it will look like you spent hours on it. I discovered the recipe this month while working on Mott’s recipes for Allrecipes. The original recipe needed some tweaking but the tweaks produced a wonderful cake that is perfect for any holiday dessert table. Applesauce is used in this cake to replace some of the fat. Have you ever tried using applesauce in place of oil or butter? I am a long time applesauce user in baked goods. It works well in quick breads, muffins and cakes. I always use it in my carrot cakes and zucchini bread so using it in this recipe was nothing unusual for me. Need some more reasons to use applesauce when you bake? Applesauce dramatically reduces the calorie count in your baked goods and an added bonus it can add must needed moisture. You can substitute 1:1 with typically no issues but if you are worried about the texture you can switch to a half applesauce/ half fat (oil or butter). I like to keep the single serve cups on hand just for baking. Each applesauce up is 1/2 cup, perfect for baking! So what do you think? Ready to try out this recipe for Gluten Free Upside-Down Double Apple Coffee Cake? A beautiful, healthier cake on Thanksgiving. Now that’s something to be thankful for! A easy to make beautiful and delicious gluten free apple- cranberry upside down cake. Preheat oven to 350 degrees F. Cut apple in half and remove core. Cut each half into slices approximately ⅛-inch thick. Stir together brown sugar, 1 teaspoon cinnamon and water in medium saucepan. Add apple slices. Cook, stirring gently over medium heat, until apple slices are softened, about 5 minutes. Sprinkle cranberries in bottom of nonstick or greased springform or 9-inch cake pan. Arrange apple slices over cranberries, drizzling with brown sugar sauce. Set aside. In large bowl or mixer, beat butter with granulated sugar until thoroughly combined. Add apple sauce and egg. Mix in greek yogurt and vanilla extract. In separate bowl, mix together flour, baking soda, baking powder, xanthan gum,salt and cinnamon. Gently blend into apple sauce mixture. Spoon batter over apples and cranberries, spreading evenly. Bake 40-50 minutes, or until toothpick inserted into center comes out clean. Remove from oven and cool 15 minutes before turning cake out onto wire rack to cool completely. A long time ago, because hard to believe it has been over 20 years I was in middle school and taking home ec class. I really liked my home ec class for the most part. I didn’t really like sewing. The sewing machine and I battled, a lot. I was constantly breaking needles. I couldn’t wait to be done with that segment of the class. When we were done sewing that meant we were moving onto cooking. We started with salads and my group was in charge of cauliflower then moved onto better things like cookies and cake. My group was dysfunctional. Another girl and I were constantly fighting over how to do things. I lost the battle of chocolate chip cookies to her but our crazy cake was perfect. It’s so perfect that just over 20 years later it is still my go to chocolate cake recipe and since it is my birthday I figured I would share it with you! 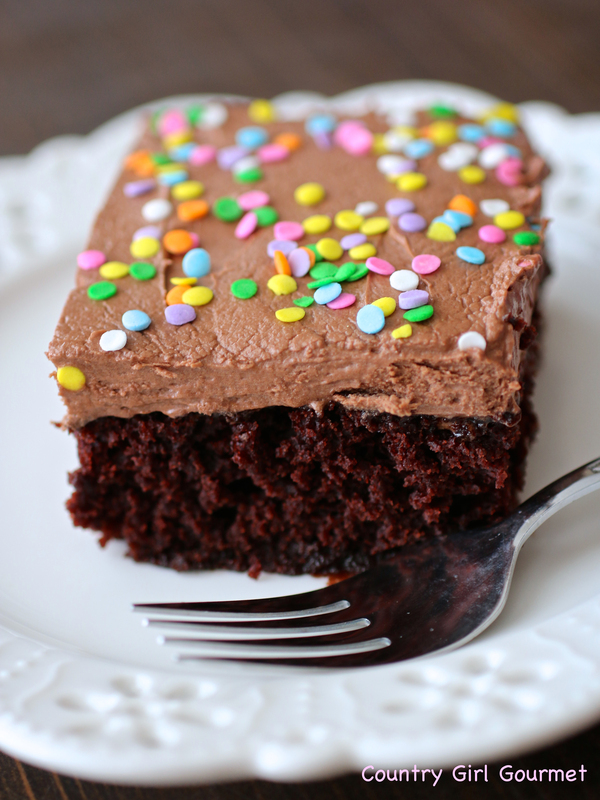 Crazy cake is a easy to make delicious chocolate cake. The crazy part comes to the ingredients. This cake does not have any eggs or dairy ingredients in it. Yes, it is a cake made without butter or milk. It is a vegan cake that tastes really good. Being that it is made without eggs and dairy it is great for those with food allergies. Plus this version is gluten free!It is made with a all purpose gluten free flour blend and it turns out beautifully. The history of the cake goes back to the depression when certain ingredients were hard to come by. With a bit of creativity and baking science they created one darn good cake that I hope you fall in love with like I have. Please note this cake can be mixed in the baking pan or in a bowl and then transferred to your baking dish. The mixing directions will remain the same. Take your dry ingredients and mix well. Create 3 wells in mixed dry ingredients. Add Vanilla Extract to one well, Vinegar to the next and oil in the last well. Pour water over top and stir well with a whisk or fork. If mixing in a bowl transfer to baking pan. Serve as is, sprinkle with confectioners sugar or frost with your favorite frosting. This cake recipe also makes wonderful cupcakes. Try it for yourself! With it being all things pumpkin season I want to share with you a sweet recipe I fell in love with last year. I cannot even begin to tell you how many times I made it. What is this creation? It is Vegan Pumpkin Pie Blondies from Allrecipes. The name blondies is a bit misleading for this recipe because it is much more cake like than blondie like but that said it is delicious! We have eaten it plain, drizzled with caramel, with vanilla ice cream and caramel on top. Every way we have tried it we have loved. The problem with the recipe it is that I don’t eat gluten anymore so I had to convert the cake to a gluten free recipe if I wanted to continue enjoying it. Which is something I most definitely want to do. So I tested it out and I am so glad I did. 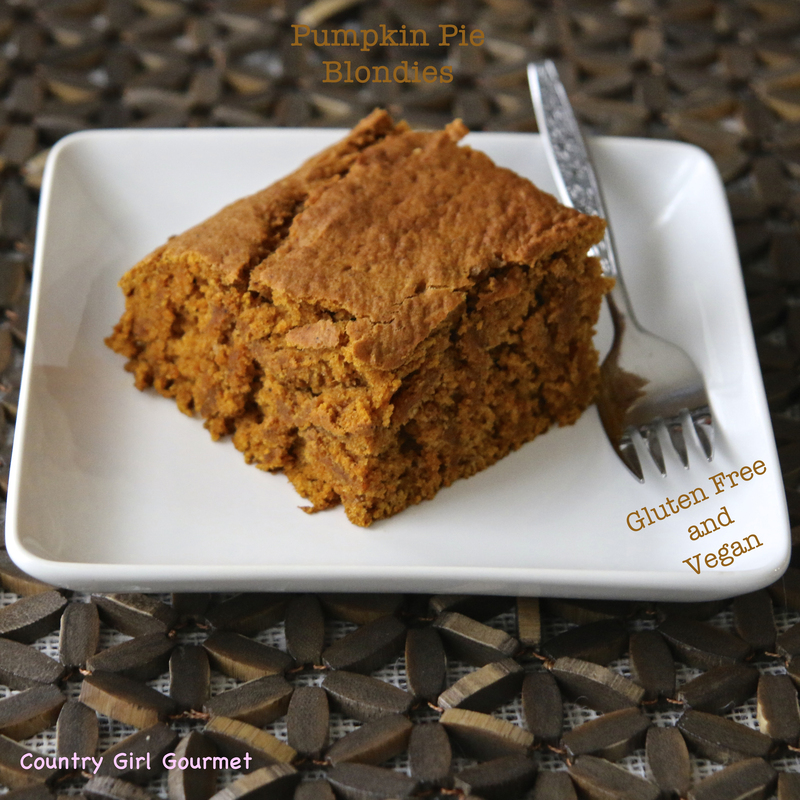 I now have a gluten free and vegan pumpkin pie blondie recipe that my family loves! If you love pumpkin and pumpkin spice flavored things as much as my family and I do that I am sure you will love it too! Try it for yourself! Preheat oven to 375 degrees F (190 degrees C). Lightly grease a 9-inch square baking pan. Sift flour, white sugar, brown sugar, baking powder, baking soda, xanthan gum, cinnamon, cloves, ginger, nutmeg, and salt together in a bowl. Stir pumpkin, canola oil, and vanilla extract into flour mixture until a thick batter forms. Pour batter into prepared baking pan. Bake in the preheated oven until a toothpick inserted in the center comes out clean, 20 minutes. Serve plain, with caramel sauce, ice cream, cream cheese frosting etc.